Take some time, today or throughout the week, to think about your priorities. Then, consider how you spent your time and energy over the last week. If you like “to do” lists, review what been on your list. Do your priorities and your energy spend match or look similar? If not it’s time to reevaluate and maybe make some changes. Time and energy are limited resources, it’s up to us to use them intelligently. It’s important to prioritize their use. We can look at the practice of asana through the same lens of priorities. What elements are the most important to embody a pose. Is it balance? Full extension through the legs? Activation of a bandha? When we can break down what’s important or what needs to be addressed as a priority we can make progress to fuller variations, but more importantly we can find a more satisfying experience in the asana we presently embody. To practice this week’s PowerPose, Parivṛtta Hasta Pādānguṣṭhāsana or Revolved Hand to Big Toe Pose, it might be helpful to prioritize. A long spine, as found in Tādāsana or Mountain Pose is high on the priority list. Creating space and length through the spine makes the revolving action much more accessible and safe. While it may seem to define the pose, the extension of the lifted leg is actually a low priority. If we put too much energy and focus in the extension of the top leg, important elements like, balance, length of the spine, and revolving get lost in instability and chaos. Try these variations to keep the long spine a priority in Parivṛtta Hasta Pādānguṣṭhāsana. Option 1 – Standing Knee Twist. Stand in Tādāsana with the feet at hip distance. Ground through the feet and affirm the length of the spine. Draw the Right leg up to 90*, with the knee in line with the hip and the ankle floating under the knee. Keep the knee pointing forward as you take the Left hand to the Left thigh. Place the Right hand on the Right hip. Press into the thigh and hip to revolve around the long spine. The Left shoulder will want to shrug forward, creating the sense of greater revolution, but don’t be fooled. Keep the chest and collarbones broad to encourage the revolution through the torso. The gaze can follow the twist, or go slightly farther if the neck allows. As you find your maximum twist, stand a little taller in balance. Release with control and try the other side. 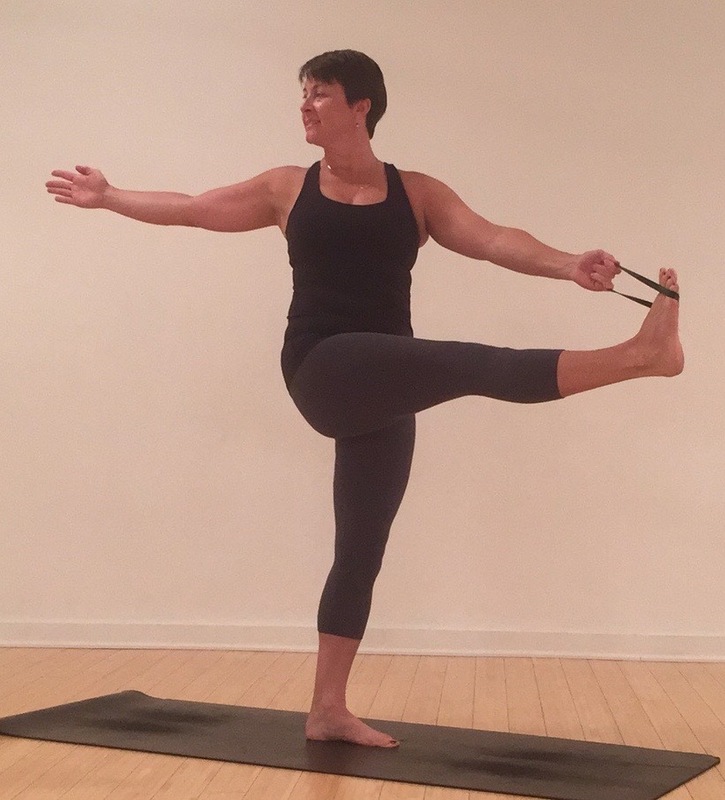 Option 2 – Standing Knee Twist with Leg Extension. From Option 1. 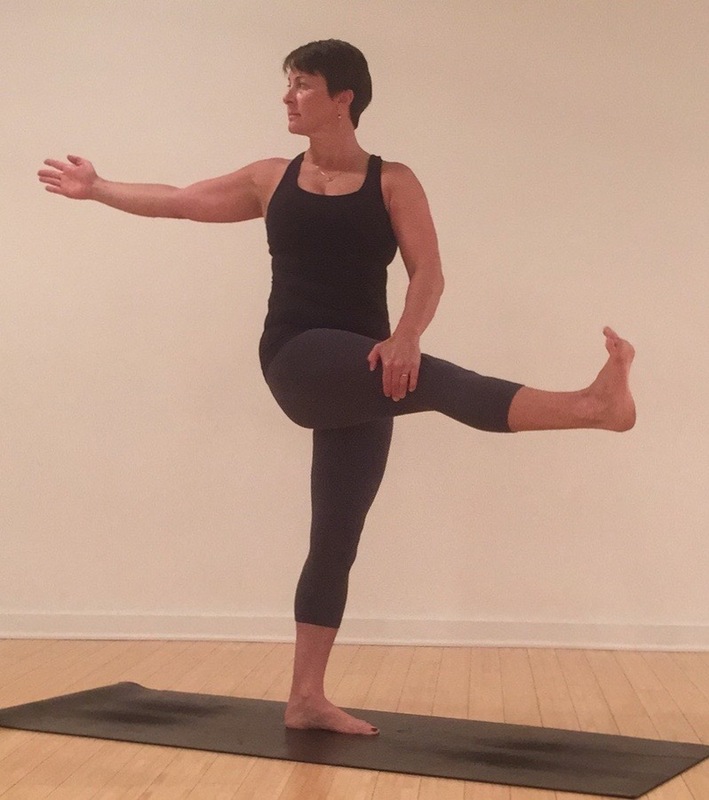 Keeping the length of the standing leg and long spine, begin to extend the top leg. It does not matter how high the foot is, work on extension through the heel as you maintain the twist. If extension is difficult, work on building flexibility in the hamstring and range in the IT band. In time, bring the foot in line with the hip. To bring more expansion into the pose, reach the back hand away with the thumb up. Use the leverage of the reach to deepen the twist. Option 3 – With a Strap. Place a strap or binding ring around the ball of the extended foot. Imagine you could extend the leg keeping the foot in line with the hip. Find a balance between the extension of the leg and lift of the foot. Use the strap to bridge the gap between the hand the foot. Keep the length of the standing leg and the spine as you pull on the strap to find a deeper revolution of the spine. There are two future options for hand placement, grabbing the big toe or reaching for the pinky edge of the foot. When you use the strap, allow the hand to find one of the positions, so you begin to build muscle memory and proper alignment for the peak expression of the pose. Work with the thumb up (big toe grab) or down (pinky edge grab), keeping the shoulder engaged on the back. Option 4 – Parivṛtta Hasta Pādānguṣṭhāsana. When you no longer need the strap, wrap the pointer finger and middle finger under the big toe with the palm facing the foot. Press the thumbpad into the toenail to create a strong grip. Begin to extend the leg, keeping the priority of the long spine. You may have a soft bend in the knee for a while before you can find full extension. For a different hold on the foot, try moving the hand to the pinky edge, or blade edge of the foot (pictured). This may require that you lift the foot slightly higher, which means more hamstring flexibility. Again, keep the spine long, and if needed, soften the knee. As you review your priorities of your life and your yoga practice, keep a spot for YOU right near the top. Let these priorities become your intention, constantly revisiting, fueling and servicing them through your life and practice. 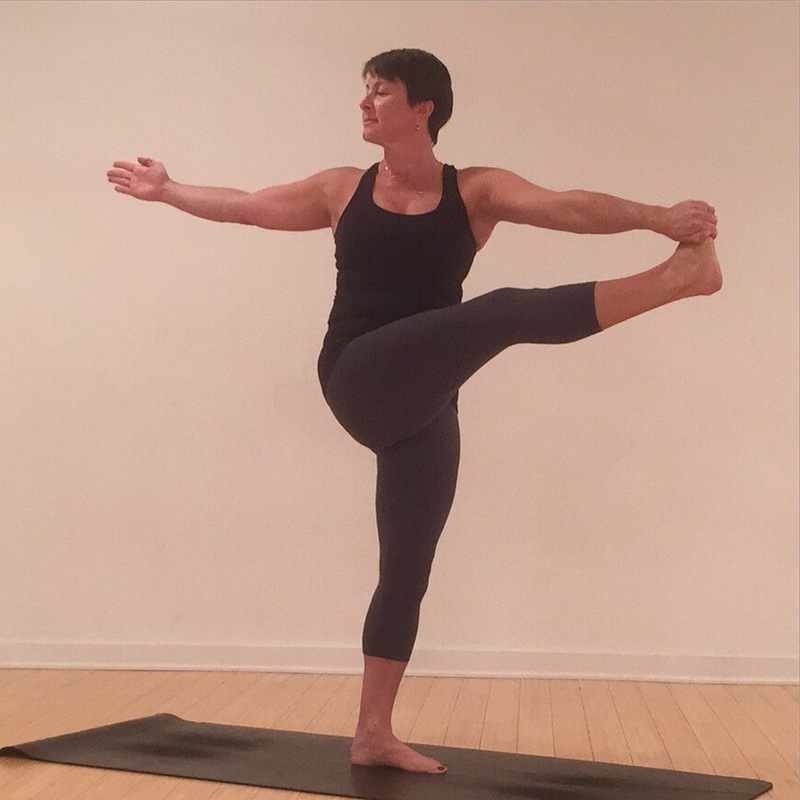 Follow this #PowerPose challenge @suzannewrightyoga on Instagram or at Suzanne Wright Yoga on Facebook. If you post your pictures or about your experience be sure to tag #PowerPose and @suzannewrightyoga.